Relocating is an exciting proposition. Whether you are relocating to a new city or simply to a new area in your existing city. Many have taken on this task. As publisher, Many can relate! We moved at the end of 1999, and moved to Southwest Florida. The Naples area is beautiful! What I didn’t quite anticipate was finding the house, hiring new services…to include banking, salon, vet, cleaning services, where to buy a car (if needed)…I had my network in Kansas City and never had to seek out solutions. It took me six years to get my network in place. It really didn’t need to take this long. I wish that I had access to a trusted network that was already vetted. Flash forward…I was in SWFL for 12 years, and when I moved back, I was so pleasantly surprised with how “normal” KC was. People that I had known for years were still in place. This is a good place to live and we are growing! If you haven’t been out and about in the “burbs” you will be amazed with all of the new development going on around the city. I recently went through the Artisan Home Tour…Wow! We are so very fortunate to be a city of entrepreneurs who just make it happen. Builders and developers in this metro continue to flourish and offer homes that homeowners want. In short, relocating in Kansas City is as important as moving to Kansas City. We still need a network of trusted resources that we can count on. If you haven’t been out for a while, check out the many, many great neighborhoods that we are fortunate to call ours. Looking to reach future residents to KC Metro through a highly targeted print and digital format? KC Relo delivers that and much more in the highest quality, low cost format. To be included in the current edition, please contact 913.534-8400 or robin@kansascityrelomag.com. KC Relo is distributed through KC Metro area real estate offices, new home sub-divisions, relocation services, area chamber of commerce, extended stay hotels and other locations specific to those moving to the KC Metro area. 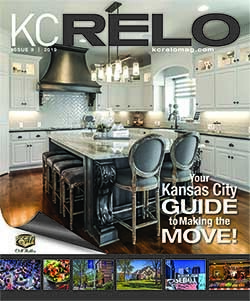 For additional copies of KC Relo for your business or non-profit organization email robin@kansascityrelomag.com. KC RELO magazine is proudly published three times annually by Fresh Start Media Group, LLC. All rights reserved. Any reproduction of this publication, in any form, is strictly prohibited. For permission to use anything within these pages, please write the publisher at the below address.